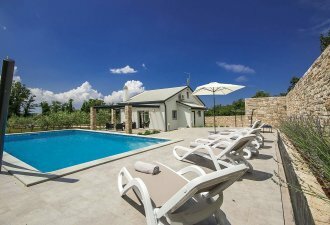 Villa Ortensia is a modern holiday home near Novigrad. The house was built in 2015 and equipped with modern furniture, it offers a swimming pool, covered terrace, barbecue and two parking spaces on enclosed property. Only 3,5 km from the house is the town Novigrad, with beautiful beaches and plenty of entertainment, sports and gastronomy offers. The Aquapark Istralandia lies about 3,3 km from the house. This area is known for excellent wine cellars and restaurants. 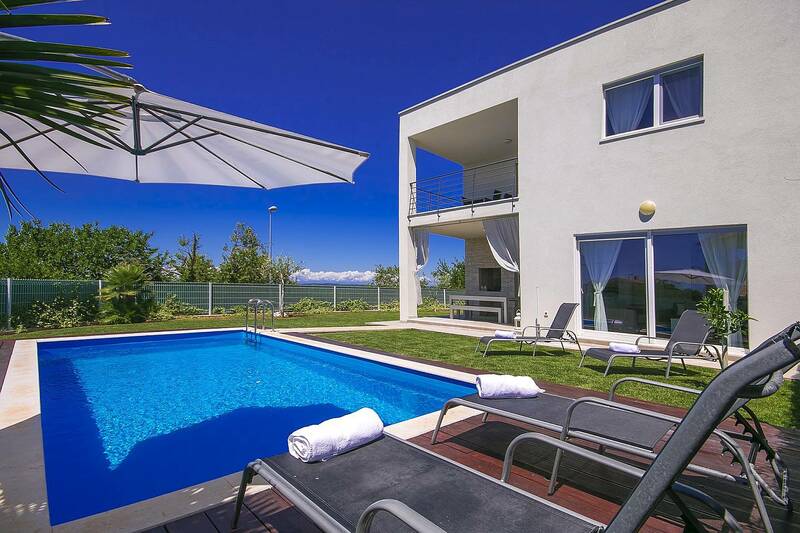 Holiday house of 161 sqm on two completely air-conditioned floors. On the ground floor, there is a nice living area with equipped kitchen, dining table, sleeping sofa for two and a separate toilet. On the first floor are three bedrooms, one with double bed, private shower/toilet and satellite TV, one with double bed and one with two single beds. On this floor, there is a bathroom in the hallway with bathtub and shower.